We start by using high quality core wire and the best U.S.A wrap. The wire is first cryogenically frozen below -320 degrees then brought to room temperature. Cryogenically treated strings are metallurgically enhanced as the process helps to tighten the structure of the alloy resulting in a reduction of surface roughness and an increase in structural durability. They hold their pitch for a clear sound that can be felt and heard. Cryogenic strings were introduced in the 1980's. We at Sfarzo Strings improved the process and taken the strings to another level. Our users tell us so too ! 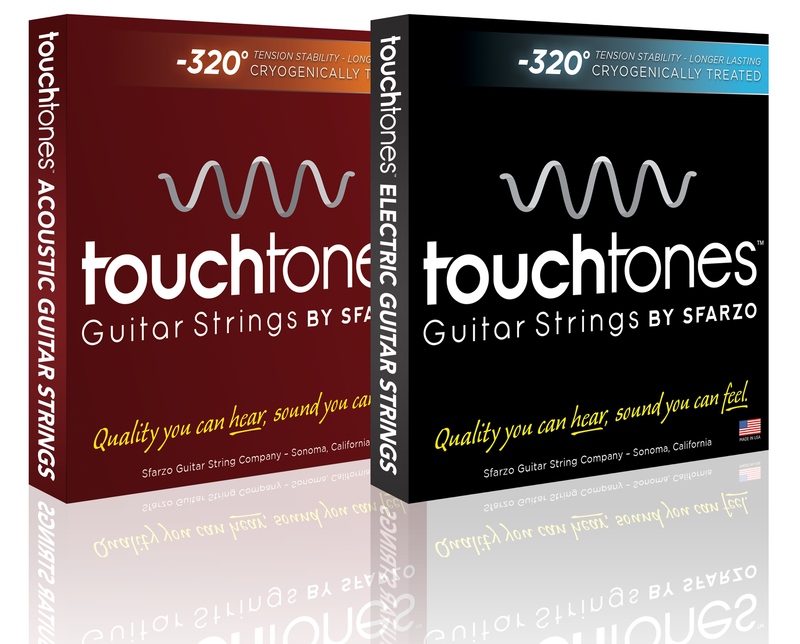 Overall, one can enjoy an extended life expectancy and longer playing time with the Touchtones strings. Musicians will not only enjoy the strength of these strings, but also how they really hold their pitch for a clear sound that can be felt and heard. Short Scale - First taper drop off, 32", Long Scale - First taper drop off, 36.5"-37.25", Extra Long Scale - First taper drop off, 38"-39.5"
920TTC	040 060 075 095 SHORT SCALE 32" 930TTC 045 065 080 100 SHORT SCALE 32" 940TTC 045 065 080 105 SHORT SCALE 32" 950TTC 050 070 085 105 SHORT SCALE 32" 9530TTC	045 065 080 100 130 SHORT SCALE 32" 9540TTC	045 065 080 105 130 SHORT SCALE 32" 9550TTC	050 070 085 105 130 SHORT SCALE 32" 920TTC	040 060 075 095 LONG SCALE 36.5" 930TTC 045 065 080 100 LONG SCALE 36.5" 940TTC 045 065 080 105 LONG SCALE 36.5" 950TTC 050 070 085 105 LONG SCALE 36.5" 9530TTC	045 065 080 100 130 LONG SCALE 36.5" 9540TTC	045 065 080 105 130 LONG SCALE 36.5" 9550TTC	050 070 085 105 130 LONG SCALE 36.5" 920TTC	040 060 075 095 Extra Long Scale 38" 930TTC 045 065 080 100 Extra Long Scale 38" 940TTC 045 065 080 105 Extra Long Scale 38" 950TTC 050 070 085 105 Extra Long Scale 38" 9530TTC	045 065 080 100 130 Extra Long Scale 38" 9540TTC	045 065 080 105 130 Extra Long Scale 38" 9550TTC	050 070 085 105 130 Extra Long Scale 38"
Just put a set of the 5050 Mediums on my '76 American Deluxe Fender Jazz and they really brought the old girl to life. Strings have an awesome clarity and ring to them with just the right amount of thud. I put them on and played for a bit. I picked up the bass the next day to find the strings stayed in pretty much in tune. Pretty remarkable for a new set. I tune these down to a drop Db tuning and the lows get ya right in the nether regions. Nice work Greg! I have heard all of the ads about strings with a alteration in output. I have tried just about every one I can think of. They either fade quickly, give higher output, but not better output or simply are a gimmick that just doesn't work. I have been a Sfarzo guy for 13 years. They have the best feel, consistency and longevity of any string I have played. However, I was excited yet pessimistic to try the touchtones. Double the price for a string? C'mon!?? I will take back everything I have said about gimmick ads that fall with hollow promises. These babies have a better and brighter focus without being tinny or brash. It widens the harmonics of the guitar and reaches out and grab notes that previously would have stayed a touch flat. They have an increased focus of presence in the upper ranges. They are more sensitive to the touch and small nuances of the player. If you have a guitar that could use a general bright switch, try these strings. If you want a little more ooomph out of the front of your amp, try these strings. If you want your tone to have a little more dynamic range and a touch more headroom, try these strings. - But most of all - If you fall in love with your amp all over again when you install a brand new set of tubes, BUY THESE STRINGS! That same increase in presence, tone, sparkle and harmonics when you swap out to new tubes is what these strings give your guitar. No joke folks. This is the real deal.